January Current Affairs. 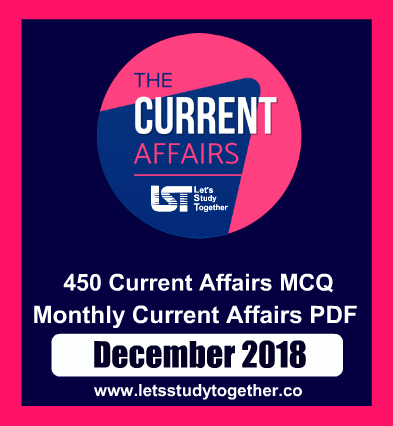 Important Current Affairs Questions – 31st January 2019. Daily Important Current Affairs. Daily Current Affairs PDF. Welcome to the www.letsstudytogether.co online Current Affairs section. If you are preparing for IBPS PO/Clerk, Canara Bank PO, banking & Insurance, SSC , Railways and other competitive exams, you will come across a section on the Current Affairs. Here we are providing you “Important G.K. & Current Affairs Questions “ in PDF format based on the current events for your daily practice. 1. Martyrs’ Day in India is observed on __________. Explanation: Martyrs’ Day (India), is observed on January 30, the anniversary of the assassination of Mohandas Gandhi in 1948. Martyrs’ day is also observed across the Indian state of Punjab on March 23, on the death anniversary of Bhagat Singh in 1931. 30 January is the date observed at the national level. The date was chosen as it marks the assassination of Mohandas Karamchand Gandhi in 1948, by Nathuram Godse. 2. A Pakistani delegation led by Pakistan’s Indus Commissioner Syed Mohammad Mehar Ali Shah recently visited the site of the 1,000 mega watt Pakal Dul hydel project in ________. Explanation: A Pakistani delegation led by Pakistan’s Indus Commissioner Syed Mohammad Mehar Ali Shah Tuesday visited the site of the 1,000 mega watt Pakal Dul hydel project in Jammu and Kashmir’s Kishtwar district. The other members in the delegation reportedly included advisor Mehmood Hayat and join commissioner Usman Ghani, sources said. The delegation accompanied by local officials from Kishtwar district administration inspected both the proposed dam and powerhouse sites during the day.Under the 1960 Indus Waters Treaty between India and Pakistan, while Sutlej, Beas and Ravi waters have been allotted to India, the water flowing in Chenab, Jhelum and Indus allotted to Pakistan. Under the treaty, both the countries have set up Permanent Indus Commission with separate commissioners in both the countries who are mandated to inspect sites and works undertaken on both sides of Indus basin. Since the signing of the treaty, a total of 118 such tours have been undertaken by the commission on both sides. 3. Civil Aviation ministry launched the country’s first Geographical Indication (GI) store in _______. 4.The new campus of the National Museum Institute was inaugurated recently in ________. Explanation: The new Campus of the National Museum Institute was inaugurated by Shri Prakash Javadekar, Union Minister for Human Resource Development, in the presence of Dr. Mahesh Sharma, Minister of State (Independent Charge) for Culture & Chancellor of the National Museum Institute (NMI), at A-19, Sector 62, NOIDA (Institutional Area), today. Shri D.S. Gangwar, Addl. Secretary, Ministry of Culture; Dr. B.R. Mani, Director General, National Museum; Alok Tandon, Chairman, Noida Authority and Dr. Pradyuman Sharma, Registrar, NMI were among the other dignitaries present. 5. Minister of Railways & Coal, Shri Piyush Goyal recently launched the report “The Future of Rail” of ___________. Explanation: Minister of Railways & Coal, Shri Piyush Goyal launched the report “The Future of Rail” of International Energy Agency (IEA) at an event here today. Chairman, Railway Board, Shri Vinod Kumar Yadav, Executive Director, International Energy Agency (IEA), Dr. Fatih Birol, Director General, International Union of Railways, Shri Jean-Pierre Loubinoux, Members of Railway Board and other Dignitaries from Ministry of Railways and IEA were present on the occasion. 6. __________ has recently assumed charge as Vice Chief of the Naval Staff. Explanation: Vice Admiral G Ashok Kumar, AVSM, VSM has assumed charge as Vice Chief of the Naval Staff today, on 30 Jan 2019. An alumnus of Sainik School, Amaravathi Nagar and National Defence Academy, Khadakvasla, Pune, he was commissioned into the Executive Branch of the Indian Navy on 01 Jul 1982. 7. The Department of Science and Technology (DST) has recently increased the monthly stipend allotted to the research fellows by ___ per cent. Explanation: After the months-long protest by the research fellows from central institutes including the Indian Institutes of Technology (IITs) and the Indian Institute of Science (IISc), the Department of Science and Technology (DST) has increased the monthly stipend allotted to the research fellows by 24 per cent. According to the new revision, the Junior Research Fellow (JRF) will get Rs 31,000 and Senior Research Fellow (SRF) will get Rs 35,000 as their monthly stipend which will come to effect from January 2019 onwards. After the last fellowship hike that took place in 2014, a JRF fellow gets Rs 25,000 and SRF fellow gets Rs 28,000 as a monthly stipend. The research fellows were, however, demanding a revision of Rs 50,000 and Rs 56,000 for JRF and SRF fellows respectively. 8. UNESCO is celebrating ______ years of chemistry’s periodic table. Explanation: The periodic table of chemical elements is having its 150th birthday, and the UN scientific agency is holding a year of events to celebrate. Anyone who has studied chemistry will recognize the table, which organizes all chemical elements by the number of protons in a given atom and other properties. Russian scientist Dmitry Mendeleev published the first such table in 1969. The UN Education, Scientific and Cultural Organization kicked off the “International Year of the Period Table of Chemical Elements” on Tuesday with a ceremony including a Nobel chemistry laureate and Russia’s science minister, among other dignitaries. 9. Which state government has decided on a five-fold increase in the number of target beneficiaries for farmers’ welfare scheme KALIA? Explanation: The Odisha government decided on a five-fold increase in the number of target beneficiaries for farmers’ welfare scheme KALIA for the landless agricultural household category to 5 lakh during 2019-20. A proposal to this effect was approved at the Cabinet meeting chaired by Chief Minister Naveen Patnaik. KALIA scheme has five components such as support to cultivators for cultivation, livelihood support for landless agricultural labourers, life insurance support for cultivators and landless agricultural labourers, financial assistance to vulnerable agricultural households and interest free crop loan. 10. In _______, lawmakers voted in favour of an amendment in BREXIT plan seeking alternative arrangements to replace the Irish border arrangement known as the Irish backstop. Explanation: In Britain, lawmakers voted in favour of an amendment in BREXIT plan seeking alternative arrangements to replace the Irish border arrangement known as the Irish backstop. With this, PM Theresa May will try to renegotiate the Brexit treaty with European Union. The amendment calls for the backstop to be replaced with unspecified “alternative arrangements” to avoid the reintroduction of border checks in Ireland. However, European Union has repeatedly said it does not want to reopen the treaty, which has been signed off by the other 27 EU leaders, and said the “backstop” was needed as a guarantee to ensure there can be no return to a hard border between Ireland and the British province of Northern Ireland. The backstop is aimed at keeping an open border between European Union-member Ireland and British-ruled Northern Ireland after Brexit. 11.The Madras High Court has extended the permission given for the online sale of pharmaceuticals till ________. Explanation: The Madras High Court has extended the permission given for the online sale of pharmaceuticals till the 20th of March. The court earlier banned the sale of drugs online, pending the framing of regulations by the Centre for such sale.However, the ruling has stayed by another bench of the same court when the online sellers went on an appeal. The Center sought more time for framing regulations for the online sale of medicines. Conceding to the demand, the court posted the case for further hearing on March 20, extending the stay of the earlier order banning it until then. 12. RBI will inject Rs ________ into the system through purchase of government securities in February to increase liquidity. Explanation: The Reserve Bank of India on Tuesday said that it will inject Rs 37,500 crore into the system through purchase of government securities in February to increase liquidity. The RBI said it has been monitoring the evolving liquidity conditions and durable liquidity requirements of the system. In a release issued on Tuesday from Mumbai RBI stated that it has decided to conduct purchase of government securities under Open Market Operations (OMOs) for an aggregate amount of Rs 375 billion in the month of February 2019 through three auctions of Rs 125 billion each during the 2nd, 3rd and 4th week. 13.Which among the following countries marked the 75th anniversary of the end of the World War II siege of Leningrad? Explanation: Russia marked the 75th anniversary of the end of the World War II siege of Leningrad, which claimed more than 800,000 lives. The city of around three million people was encircled by the Nazi troops for 872 days between 1941 and 1944. With supplies to the city cut, bread rations plunged to 250 grams (about half a pound) for manual workers and 125 grams for other civilians. More than 800,000 people died from hunger, disease, or the shelling. Many historians say the true figure is even higher. 14.Dilip Sadarangani has been appointed as the part-time chairman of which among the following banks? Explanation: South-based private sector lender Federal Bank said it has appointed Dilip Sadarangani as the part-time chairman. The appointment of Sadarangani, who has been on the bank’s board since 2013, has been cleared by the Reserve Bank as well, it said in a statement. 15.Which among the following states has been declared as the best state for its active participation in the national campaign ‘Swasth Bharat Yatra’? Explanation: Tamil Nadu has been declared as the best state for its active participation in the national campaign ‘Swasth Bharat Yatra’, which was launched on October 16 last year under which a pan-India cycle rally was organised to sensitise people about eating safe food and being healthy, food regulator FSSAI said. With more than 10 lakh participants and 2.5 crore people reached, the yatra has made ‘Eat Right India’ a people’s movement, it added.